In the middle of Star Wars, Episode 5, we see Luke Skywalker land on the planet of Dagobah to try to find the great Jedi Master Yoda. After Luke lands his X-wing fighter, he runs across a small creature and they engage in a conversation about Luke looking for this great Jedi Master. As the conversation and evening wear on, this small creature slowly begins to reveal that he is in fact Yoda, the Jedi Master Luke is looking for. Ready, are you? What know you of ready? For eight hundred years have I trained Jedi. My own counsel will I keep on who is to be trained! A Jedi must have the deepest commitment, the most serious mind [to the invisible Ben, indicating Luke]. This one a long time have I watched. All his life has he looked away... to the future, to the horizon. Never his mind on where he was. Hmm? What he was doing. Hmph. Adventure. Heh! Excitement. Heh! A Jedi craves not these things [turning to Luke]. You are reckless! 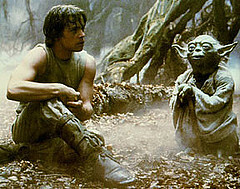 Yoda's primary concern with Luke was his lack of contentment. Luke's problem was that he was always looking way off into the future. He never considered where he was in the present. In all of our lives, it's so easy to get focused three steps ahead of where we're at right now. When you're a kid in grade school, you want to hurry up and get to middle school. When you're in middle school, you want to hurry up and get to high school, because that's where all the cool kids are. When you finally reach high school, you want life to hurry up and speed along so that you can drive a car, graduate, and get into college. When you get to college, you want to find Mr. or Mrs. Right, graduate, land a great job, get married, buy a house, and have children of your own. Then, once you thought you have "arrived," you want your kids to hurry up and grow up so that you can have your "life" back! I know all of these things to be true. I've been there, and I'm sure you have as well. We all struggle with discontentment at some level in our lives. We have the common tendency to always think that the "grass is always greener" at the next level of life. We think that reaching the next level in life is going to bring us more happiness than what we are experiencing right now. We end up chasing a rainbow that never materializes. The true reality, though, is that if we're still six feet above ground today, then we're living in the rainbow (at least while we live here on the earth). Our lives our blessed, we just don't recognize it in the moment, because we're so intently focused on the future. Several months ago, I turned forty years old. Some people freak out on the big birthdays that end with a zero, but with everything I have been through in my life over the last two years, I have to honestly say that it didn't phase me a whole lot. So what, I'm forty... big deal. At least in my own mind, I still feel like I'm in my late twenties or early thirties. Some of my friends have told me that I'm a "young" forty. In today's world, perhaps forty really is the new thirty. I can only hope this is true for me! Before my divorce, I was pushing, kicking, struggling, and just plain not necessarily happy with where I was at. I wanted to accomplish some big things in my life, but for whatever reason, things were just not happening as fast as I would like them. I think I really did lose sight of the fact that there were some really cool things happening in my life, and I never embraced them. I was never truly thankful for what I did have until a good chunk of it was stripped from me. I recognize today that this where I most likely failed my marriage and my family. So after living through some great challenges in my late thirties and into age forty, I have a different perception on contentment. I wouldn't say I have arrived, but I definitely look at life with a different set of eyes. I would like to think that I am more content with where I am at today. I am definitely working harder at living in the moment than allowing life to simply rush by me as I try to reach the next life stage. I am truly thankful for God teaching me some important lessons the last two years. My only regret is that I had to learn them the hard way. So, are you living a life of contentment, today, or are you three steps ahead of yourself looking into the future? What do you need to do to live this day and every day in a state of contentment?